We said we were going to look into adverbs of degree and what we call ‘gradable words’ today, because they are very useful in expressing emotions, which was the subject of a number of lessons lately. Degree expressions usually modify the meaning of a particular word in a sentence, or in a clause. To get you a step nearer to these degree expressions, think of the aspect of ‘how’ about that particular word in the sentence. "How much do you know…?" "How much does he want…?" "How much of a businessman is he?" "To what extent do you believe him?" "How far do you agree with me?" "I agree with you absolutely." MailOut Manager – This is the place where I create, publish and manage our e-zine. It is very intricate, once you get into it and it took me a few months until I figured out how to work with all its aspects. 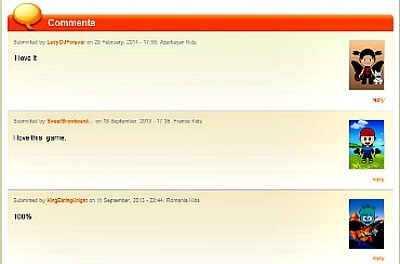 RSS/Blog It! -- This tool automatically builds/updates a blog page and the RSS feed for us. MX It! – Here we can receive and send mail from Google Apps Gmail or other mappable mail system. Infin It! – I don’t know how yet, but we can also set up a blog, forum or other application on an external host and have it appear as a subdomain of your site. Name Park It! – Should we think of a domain name, but not want to start working on it until later, for various reasons, we can ‘park a domain name’ for less than $12 per domain per year. Move It! – If we have another site built somewhere else, we can move it to a domain name parked with Name Park It!. AutoPilot It! -- This helps us to put a low-performing site on autopilot for just $50/year, if there is another SBI! subscription. Traffic Stats -- This section provides easy-to-understand information about who is visiting our site... numbers of visitors, which pages, entry and exit pages, and how people find you (referral and keyword-search stats). Your GAP Calculations -- If our site was affected by Google's Panda, Penguin, Phantom and/or Chipaway, use this tool to determine which algorithms hit your site, and by how much. This is for more advanced website builders. For us right now, it’s an indication that we can be in control over what search engines do with our sites, which is good to know. Value Exchange HQ -- A unique, productive, honest way to exchange links with other sites focused on quality. No tricks, just results. Once our site reaches 20 or more pages, we need to register it at the Value Exchange. The more links we have into our site, the more valuable it becomes – it shows that other people like it and they use it as reference. By agreeing to exchange, we also help them to increase the value of their site. Image Search HQ -- Find which images bring visitors to our site from the image search engines. Local Search HQ -- Use the information here to be found by local customers as well as global ones. Other Search HQ -- This includes Video Search, Shopping Search and Pay-Per-Click. Click Data -- Click-throughs create income. If we choose this radio button and then click on Show Me Data, you'll see how many people are clicking which links on which pages of your site. Sliced and diced, just the way you like it. On the other hand, Click-INs cost us either time and/or money. If we choose this radio button and then click on Show Me Data, we'll see which of our "off-site" links (or offline URLs) of our various promotional efforts are working. 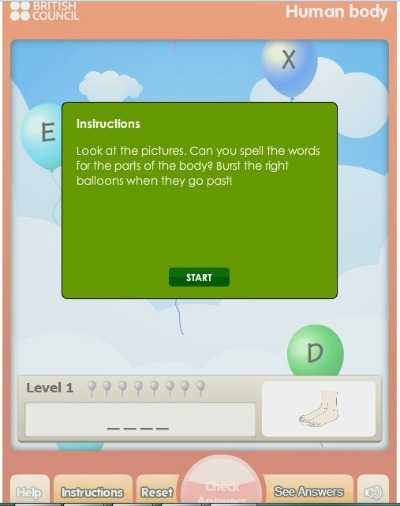 From the same website I’ve introduced to you before, Learn English Kids , I’m bringing you a new game to help your children improve their spelling. We all know how difficult it is to internalise the need for good spelling. The question is... why leave it until it's too late - perhaps after you've had such a terrible time with your writing studies for such a long time? 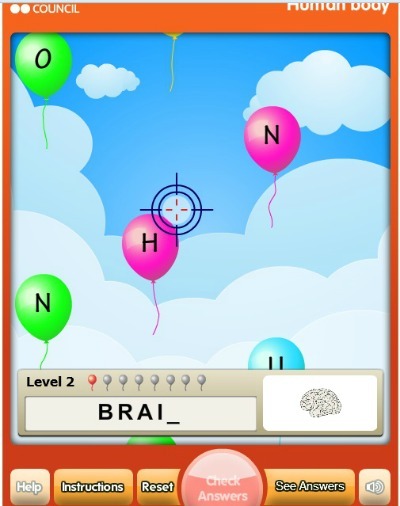 This is a very gentle game for children of maybe 4-12 years old, depending on their starting point in learning English. In other words it is useful for beginners in their first year of studying. There is no particular timing in this game. It's better if we don't rush young children, or else they can feel intimidated. However, if you play with them, or supervise them during their game, you do need to have a good dose of patience, as the letters pop up and rise quite slowly. Once all the letters have been inserted in the allocated spaces, there will be a clapping and cheering sound, together with words like "Awesome!" or "Well done!" coming up, to celebrate their victory. At the same time, you are prompted to select your following word, and the board indicates the next level up, in our case 'level 2'. This doesn't mean that the next word is at a more advanced level than the previous one, it only means it's the second word in a line of 8 words or so. And so it goes, until you get to the end of the game. There is no final score, or any other competitive measures - you can leave the game whenever you wish, in order to not stress your child too much. Having said that, if I were a parent, I would have my child(ren) get used to reaching the end of the game every time, for the sake of forming a good habit of finishing the task in hand. This is not too strenuous for children of even 3-4 years old. You know how it is - if they choose their games, they will not leave them easily. Well, this is just the same, if you can make them think this. Another interesting feature on this website is that children can leave comments at the end of the game and other children in the world can reply, in the format of a chat/comments facility. This would make children realise that they can communicate with other children in the world, hence it will put another perspective on learning English. All of a sudden English is actually useful and practical in making friends worldwide, which can be very motivating. How many of you think you would have liked English more, if you had this kind of freedom in communicating with others worldwide when you were growing up? You can see how the first child posted a comment saying "I love it. "; the second comment was "I like this game." and then you can see "100%", meaning the child was quite proud of achieving the top score. For your information: it is actually free to sign in and create an account. Your child would need to select a nickname in the process, as the website protects children's privacy. They can also choose a picture for themselves and the colours and style of their face, hair, their clothes, etc. This way the subscribers are not exposed to any malicious external interests and parents can be absolutely certain their children are playing online in a safe environment. I hope you find my idea to post games for children (or beginners) as well acceptable. I did it, in my wish to serve a variety of readers, so please don't be put off - there's more to come for you next week.